Very convenient to interstate, metro and Old Town, we enjoyed living there.submitted by Alan N. - Nov 04, 2015 |Recommended: YesWe would recommend Carlyle Place highly. I love it here submitted by Martinia R. - Oct 18, 2015 |Recommended: YesI love everything about my apartment It's a great size for a 1br with an amazing closet The staff are friendly and helpful. Having the concierge there everyday until 2am is also great The only downfall would be the kitchen. Its beautiful just slightly small. I think that if it was an open kitchen it would just complete the apartment. Nice place to livesubmitted by Shawn P. - Oct 16, 2015 |Recommended: YesNice place to live, I recommend it to everyone. It's Greatsubmitted by Gerald F. - Oct 12, 2015 |Recommended: YesI would move here. Apartments are nice. Property is well maintained and prompt for work orders. Only down side of the apartment is the cable provider Comcast . Professional Convenience. submitted by Julie W. - Oct 07, 2015 |Recommended: YesIf you are looking for a convenient place to live with polite and professional staff, Carlyle Place is good place to rent. Nice apartment but thin wallssubmitted by Patrick M. - Oct 02, 2015 |Recommended: YesGreat layout and size for the price, but I can hear my neighbors on both sides of the apartment. One side has their kitchen cabinets against the shared wall, so all you hear in the evening is slamming drawers. On the other, is a yappy dog that doesn't get out enough. Its nice, but the noise travels strangely through the walls. For instance, you can hear traffic in the bathroom, even though its the furthest thing away from the external walls. Great Propertysubmitted by Lamont D. - Sep 28, 2015 |Recommended: NoIt has been a great experience. 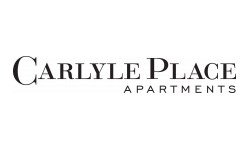 Great submitted by Kristin M. - Sep 04, 2015 |Recommended: YesI think the Carlyle Place is a great place to live. The Staff and Residents are welcoming and friendly. The amenities are great and kept well clean. What continues to amaze me about the Carlyle Place is the sense of community. I like that they offer monthly social events to gather residents. Love it submitted by Melise B. - Aug 19, 2015 |Recommended: YesIt is elegant, convenient, well-built so I never hear the neighbors, great staff. There is some city noise --like trains, but, frankly, have you heard the noise level in the suburbs Lawn mowers, leaf blowers, pool parties -- I have downsized from all that and am very happy with the trade. It is great.submitted by Robert F. - Aug 09, 2015 |Recommended: YesIt is reasonable and convenient if you live and work in this area. Great place to live submitted by Jesse J. - Aug 01, 2015 |Recommended: YesModern, clean space The ranking criteria for Noise needs to be rewritten. If the question asks Can you hear your neighbors all too well that means to me a One Star is No, i don't and Five Stars means Yes, I do. response from property - Aug 03, 2015 Jesse, Thank you so much for the valuable feedback and for the review. We sincerely appreciate it and will definitely review the survey and make the necessary changes. Sincerely, Taryn S.
Secure, convenient, clean, quality customer service, best valuesubmitted by Unavailable - Jun 06, 2015 |Recommended: YesI lived at Carlyle for five years and I thoroughly enjoyed it. It is convenient to DC and MD via car or public transportation. The apartments are a nice size for the price. The maintenance staff is very response. I would have stayed longer had my job not transfer me to another area. I highly recommend Carlyle over any other rentals in the Alex OldTowne area.